Tara and I got back from a weekend trip to the Oregon coast yesterday afternoon. It was my anniversary gift to her, and it seemed fitting. After all, we were married at the coast. We always make it a point to catch the sunset when we’re there. Friday evening, we arrived with about 90 minutes to spare. The view from our second-floor, corner unit condo was unbelievable. As the sun sank toward the horizon, we sipped wine and watched as no fewer than a half dozen whales swam slowly by offshore. Talk about magical. After the sun dipped below the horizon – we watched it literally wink out – there was a long, slow fade to darkness. We watched the sky very gradually turn from orange to pink to black, a process that took a good ninety minutes. Saturday night’s sunset was equally spectacular, but also very different. It had been perfectly clear all day and unusually warm for Newport, 80 degrees or so. 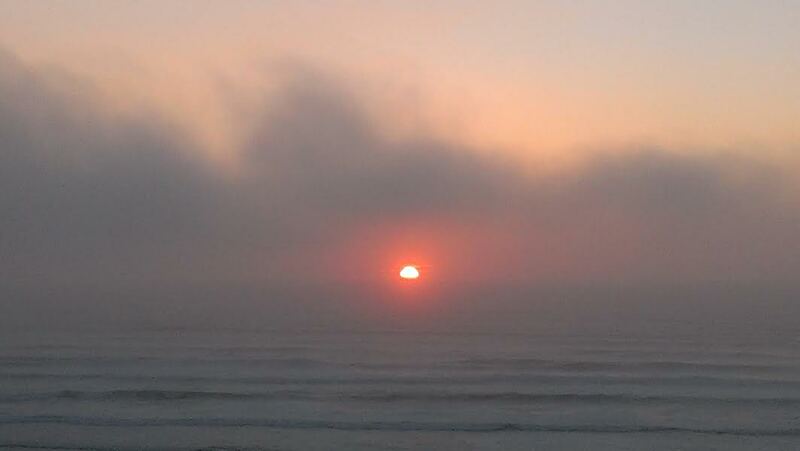 Just as the sun was nearing the horizon, wisps of clouds from an offshore fog bank began to drift in. They raced across the sky on a stiff breeze, trying to blot out the sun. The same view, three minutes later. It went from light to dark in minutes, the complete opposite of the previous evening. Not that it mattered; we were tucked inside the condo listening to music, drinking alcohol, and cooking an amazing dinner. Fresh dungeness crab, rice pilaf, and corn on the cob. 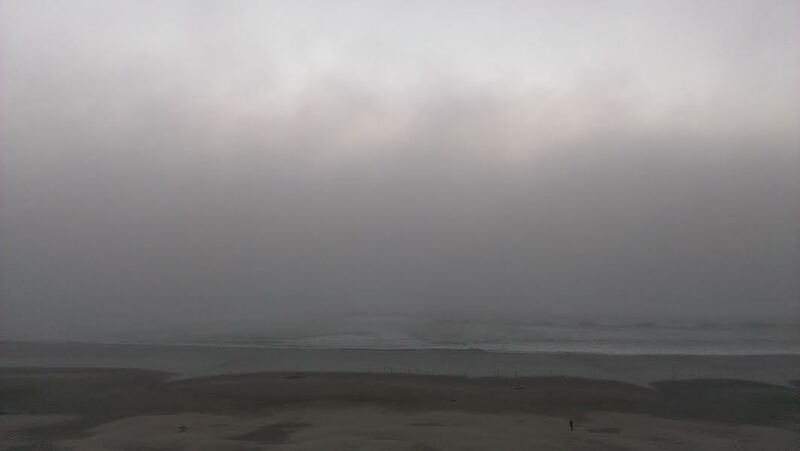 The ocean weather was marginal in the forecast to begin with but in one hour the ocean swell went from 7.2 foot to 8.2 foot to 9.8 foot and now at 10.5 foot. That is a really quick rise in swell in a real hurry. The result is a total cancellation from the Tradewinds fleet this morning. No wind to speak of but really rough especially at the entrance to the harbor. Oh, well. We ended up walking along the bay front in Newport, watching the sea lions up close before heading to breakfast and Bloody Marys. Then we grabbed some fresh crab from the South Beach Fish Market because we had really had our hearts set on that crab. All in all, a great weekend. Here are a few more pics from our getaway. Gorgeous. I want to get up close and personal with sea lions. I was a little apprehensive about getting any closer. Word is, they can be territorial and aggressive, especially during mating season. I have no idea when so-called “mating season” occurs, but figured 20′ away was close enough, just in case! Wow! I have never seen whales or sea lions in the wild. I did see dolphins once in SC, and I was enchanted. Your trip sounds very relaxing! When I lived in the Bay Area, it was common to see the sea lions congregating around Pier 39. Nowadays they’re a major tourist attraction. Funny, the things we humans are attracted to! I saw these pics on instagram. That first shot you each took of the wine glass with the sunset behind it is breathtaking! Happy anniversary, lovebirds! Thanks, Jess! All I can say is, Tara totally copied my idea with the wine glass shot. But it’s okay, I kinda like her so I’ll let it slide. Plus, hers was a unique perspective anyway. Talk about magical is right, Mark! 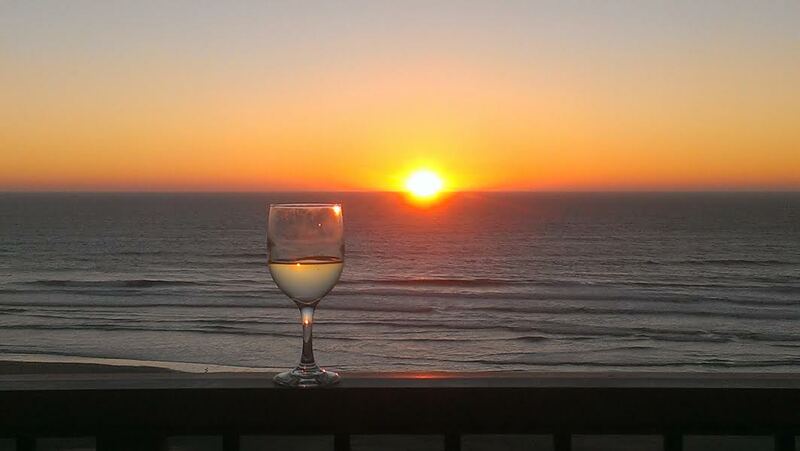 Holy cow, that photo of the sunset and wine glass is spectacular! But I gotta say, I also love the second sunset shot as well because it’s very dramatic and Goth-looking. I’m one of those weird people who enjoys the beach on very gray and cloudy days. Great slideshow too. LOVE the sea lions! Thanks for sharing your weekend, bud! You would absolutely LOVE the Oregon coast, Ron. 8 days out of 10 it’s gray and cloudy. Saturday was one of the warmer days of the year in Newport, but you can see how quickly that changed once the sun set. Now, they probably won’t see much sun out there for the next few weeks…err, MONTHS at this point. Happy first day of fall! Beautiful photos! It looks like a gorgeous weekend. Thank you! It was. So much so, we’re already tentatively thinking about doing it again. Will the Real David Crosby Please Stand Up? The Crosby Show Airs Again!